The Conwy Falls HEP scheme was refused at it’s first try because the application didn’t hold enough information or visuals on the likely impact to the landscape. The weir / dam and the outflow were of particular concern. That information has been included in this latest application. 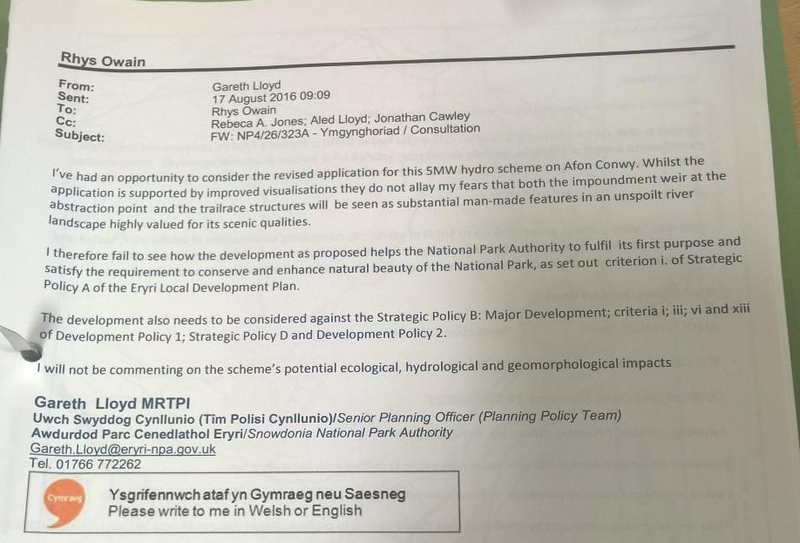 Gareth Lloyd, Senior Planning Officer (Planning Policy Team) Snowdonia National Park, has advised the Planning Officer (Richard Thomas) on what he thinks of new application, an excerpt is below and the full document is at the bottom of the page. Now both the Senior Ecologist and the Senior Planning Policy Officer have advised the scheme be withdrawn will the Planning Officer in charge still recommend this for approval?